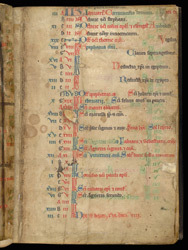 This calendar is clearly Scottish, including, for example, a record of the death of William I, 'The Lion', King of Scotland (1143-1214), on 4 December. On 20 January, a little more than half-way down this page, is an entry for a very rare saint, St Vigianus the confessor (Sci. Uigiani co'f. '), patron of Arbroath Abbey. This makes it very likely that the calendar was written for the abbey. On 30 March the Dedication of the church has been added by a later hand.